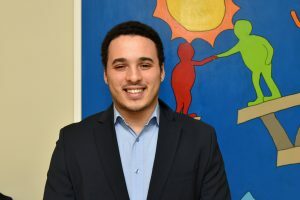 OSWEGO — Campus Compact recently named Ariel Gutman-Gates, a SUNY Oswego junior psychology major, one of only 262 Newman Civic Fellows nationwide for 2019-20, recognizing his passion and hard work in growing the college’s program for students who struggle with food insecurity. SUNY Oswego junior psychology major Ariel Gutman-Gates recently earned a national honor, a Newman Civic Fellowship for 2019-20, recognizing his service on campus, especially his leadership of SHOP, the college’s food pantry. College President Deborah F. Stanley nominated Gutman-Gates for the fellowship, noting his skills in community engagement and advocacy in growing SHOP, the campus food pantry. The Newman Civic Fellowship is a one-year leadership opportunity in civic engagement for community-committed college students from among the 1,000-plus member institutions of Campus Compact, a Boston-based non-profit working to advance the public purposes of higher education. For Gutman-Gates, service, community engagement and the pursuit of social justice are all in the family, thanks to his late father, attorney Jeremiah Gutman, who was a noted civil rights activist and an original member of the New York Civil Liberties Union, and his mother, Marilyn Gates. In high school, he brought speakers in to talk for a Martin Luther King Jr. memorial and volunteered at New York City’s JCCA, an agency serving children in foster homes following abuse or neglect by their prior caretakers. At SUNY Oswego, Gutman-Gates served as a Laker Leader captain on the New Student Orientation team; is president of Active Minds, a campus club that empowers students to speak openly about mental health to educate others and encourage help-seeking; co-founded a Girl Up chapter that organizes fundraisers for health-related needs of girls in Africa and South and Central America; served on the Student Conduct Committee on campus; and has been a peer educator through the college’s Lifestyles Center. Then came his work with the campus food pantry. Now, as student coordinator of SHOP, Gutman-Gates manages a roster of more than 125 volunteers, handles a budget and all donations of food, toiletries and clothing, and works to expand services, such as offering school supplies to students in need.